Steve Chalke blogs about his thoughts on the eve of the launch of the Apprentice tour. Less than 24 hours now until the first ‘Apprentice the Tour’ event kicks off at church.co.uk. Waterloo and I’m excited! I’m currently in Salford at our National Forum with the Principals from 11 Oasis Academies around the UK. I’m enjoying the company of some of the country’s most outstanding and inspirational head teachers. They say that a great teacher is one who truly interacts with their students - their apprentices. At ccuk Kennington Road (opposite Lambeth North tube) tomorrow night, we’re going to do just that, we’re going to ‘interact’ with the teaching of the world’s greatest rabbi – Jesus, as we grapple with some of the truths, challenges and complexities of what it means to be a ‘apprentice of Christ’ in our 21st Century melting pot - see you there! 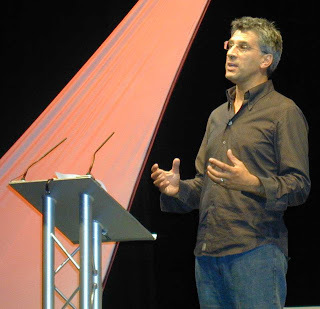 Taking place this autumn in venues around England and featuring activist and author Steve Chalke, Apprentice the Tour is an opportunity really get to grips with life as a follower of Jesus. We are invited to explore some of our most probing questions and to embrace our greatest doubts along with Steve Chalke and guests Cathy Burton and Diane Louise Jordan. Free copy of Apprentice book!